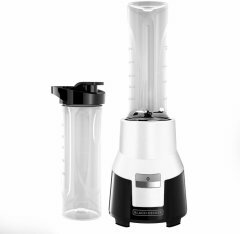 Because of this 's overall rank of 76%, we believe that the Black and Decker PB1002 is currently Alphachooser's best Black and Decker blender 2019. Furthermore, we think that our sample of 723 reviews from our sources gives us a high confidence level (more on confidence levels) that pushes us to call it a "no-brainer best choice." Because of 3.5 stars derived from 117 reviews, we rank this Black and Decker model second best Black and Decker blender. * These choices are based on a full aggregation of hundreds of reviews from multiple sources. Sophisticated-looking 48-ounce 700-watt blender with a four-point stainless-steel blade, twelve speed settings, and a two-year warranty. Sturdy-looking 6-cup 475-watt blender with a die-cast motor component, a multilevel stainless-steel blade, and a two year warranty.